Enjoy an afternoon filled with fun and cookies baked with love. 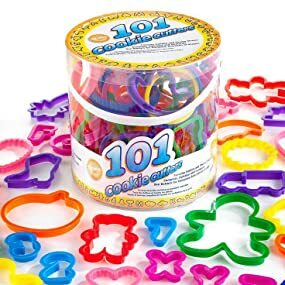 This 101 piece plastic cookie cutter set is fun for the whole family. With dozens of shapes and sizes to choose from, kids will love making delicious cookies using their favorite shapes. You’ll love using the season shapes for the holidays and the specialty shapes will come in handy for unique birthday parties and personalized treats for someone special. Letters and numbers set is also great for teaching with hands on fun.